Public celebration of Ganesh festival, which has a long history in Maharashtra, is also deteriorating very fast from its original purpose as foreseen by its founder Lokamanya Tilak. It no more serves as a platform for social or educational reformations; it is just a showbiz with wasted talent. Ten-day festival is turning into torture to the local people since they have to face extortion in terms of compulsory subscription as demanded by festival organizers and noise pollution. People are always in the constant fear of major/minor incidents of quarrels of Ganeshbhaktas. The worst part is on immersion day during which thousands of idols will be thrown into the water resources from which water is supplied in the area. In Maharashtra, Ganesh festival is not only a religious family function of individual family but also a public festival during which cultural, social and educational programs are organised. Big pendals are erected practically in the middle of the road creating traffic jam, local artists decorate Mandapams and large idols of 1-2 m height are installed. Besides these public displays every house has its own idol, which is immersed on last day. Since these idols are made of clay or plaster of Paris and painted by using toxic paints, the water gets polluted when thousands of idols are immersed in still or running water. In fact one of the corporations had set aside Rs one Crore to erect a permanent structure so that big idols can be immersed with pomp and show. Fortunately good sense prevailed and that scheme was aborted. The daily routine of idol worship is generally accompanied by offering flowers. This worship continues for ten days. The accumulated dry leaves and flowers (Nirmalya) are also thrown in the water along with idol. This further aggravates the situation of water pollution. ANS selected places like Pune, Sholapur, Satara, Kolhapur, and Islampur etc. last year and requested that the idols and dried flowers be donated to ANS instead of immersing them in the water. ANS activists made arrangements with municipal authorities to carry the idols to an abandoned stone quarry where water is logged but not used for drinking or any other purpose. A few religious fundamentalists backed by reactionary organisations tried vehemently to oppose this defamation of glorious Hindu traditions, which did not have sanctions from ‘authority’. The pressure from the common people to follow the new proper method made them quit the stage. Surprisingly there was a very good response from all walks of society. In fact the city like Pune is known as the bastion of orthodox people. ANS was very much surprised by the initiatives taken by citizens of Pune. ANS activists had taken care to respect the religious feelings of disciples of Ganesh though they did not believe in the religious rituals. They ensured that the idols were not mutilated and were shown same respect was shown as by the staunch worshippers. This has attracted attention of all and the credibility of ANS was established beyond any doubt. ANS, therefore, initiated campaign for ‘Moorthi Daan’ (Donate the idols). There was a very good response from every body about campaign. 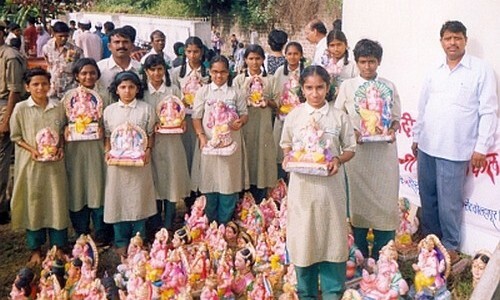 ANS was able to collect more than 1000 idols in Pune itself and more than 15000 idols from all over Maharashtra and managed to immerse these idols in unused stone quarries. Along with Moorthi Daan, ANS initiated a campaign for ‘Nirmalya Daan’ (donate the dried flowers). Kolhapur Unit of ANS is implementing this campaign for last 7 years and got a very good response. ANS collected 10-15 truckloads of dried flowers. These were given to agriculture department to convert them into organic fertilizer. ANS is trying its level best to curb the bad practices prevailing in the festival. ANS wants to spread the campaign in all the remaining districts of Maharashtra on a large scale during this year. The protection of environment is and should be the duty of every one. As such this activity need not be sole concern of ANS. Like-minded organisations should also come forward and associate with the good cause. The campaign should have the same seriousness as that of ‘Donate Blood’, ‘Donate Eyes’ etc. These festival days can be utilized for poster exhibitions since large numbers of people visit the pendals where local artists exhibit various types of decorations which are based on mythological, social and political themes. Since these decorations are very good crowd pullers, we too can utilize these to send messages on de-addiction, consumerism, cleanliness, environment etc. ANS commissioned an artist to prepare posters on themes of our interest and printed about 1000 copies each last year. Our activists pasted these posters at various locations, which attracted large crowd. Thus festival season was utilized to educate people on some of the burning issues, which need attention. ANS is advocating various methodologies to celebrate the festival to suit the local conditions. If local conditions are not suitable for Moorthi Daan, even a small tub can be used to conduct rituals of immersion and remains can be buried in an open space near the house. This will enable to prevent large-scale water pollution. In fact organizers are requested to contact ANS for further information in this regard and get detail plans on how to utilize these festivals for good purposes. Thus festival celebrations need a paradigm shift commensurate with new age, new society and new mood.